Local races for village boards, town boards and school boards will dominate Tuesday’s Spring Election with several referenda sprinkled throughout the three-county area. The lone statewide race on the ballot is for Wisconsin Supreme Court to replace Justice Shirley Abrahamson, who is not seeking re-election. The candidates are current appeals court judges Brian Hagedorn, of Oconomowoc, and Lisa Neubauer, of Racine, who is the current chief judge. 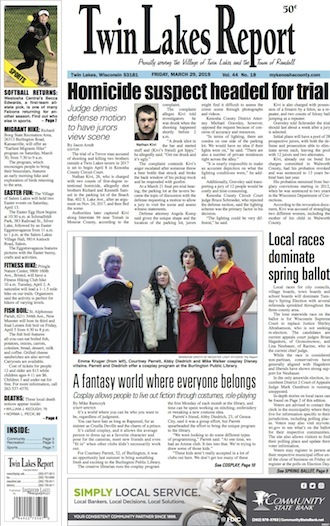 In-depth stories on local races can be found in this week’s print edition. The newspaper will be available at retail outlets on Friday and subscribers will receive their copies with Friday’s mail. To arrange for weekly delivery, click here: SUBSCRIBE. HEADED FOR TRIAL: Nathan Kivi, a Trevor man accused of killing two brothers, will head to trial in early April. BOUND OVER: The wife of a former Twin Lakes police captain was bound over for trial in Walworth County Circuit Court. COMPETENCY EVALUATION: Is a teenager who allegedly stabbed her father while being sexually exploited online by another man competent to stand trial? That is what prosecutors and defense attorneys would like to know before they move forward with a preliminary hearing against the 14-year-old Twin Lakes girl. SOFTBALL RETURNS: Westosha Central’s Becca Edwards, a first-team all-state pick, is one of many Falcons returning for another season. At Wilmot, the Panthers are counting on a dynamic duo in the pitcher’s circle and leadership, as they enter the season.